What are you doing to make a difference through CAP? 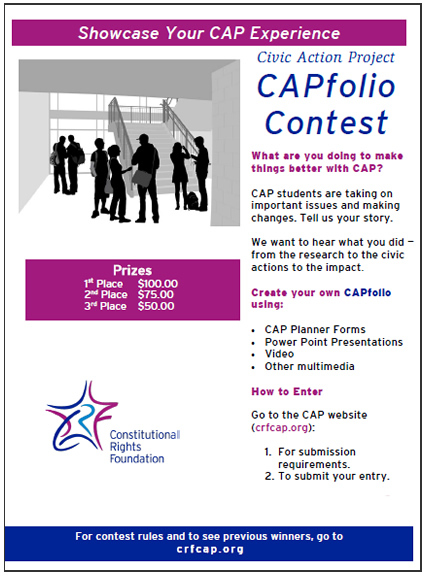 Showcase your CAP experience through the CAPfolio Contest. We want to hear what you did – from the research to the civic actions to the impact. Illustrates the civic actions you took to make a change and influence public policy. Adequately describe the problem or issue? Explain why change is important to your community? Describe the civic actions that you completed to influence public policy? Make sure you are registered on the CAP website to enter the contest so that we can communicate with you. Submit your entry via our file share and send to david@crf-usa.org. Don’t worry, if you have trouble submitting your CAPfolio please contact CAP Staff and we will help you! Please do not use any copyrighted music, images, or text without the express permission of the copyright owner. For more information about copyright and fair use, please visit educateip.org.